The UK government has been accused of creating "appalling delays" to the outlawing of caste discrimination. Ministers have announced they do not expect to introduce measures to Parliament until the summer of 2015. The Anti-Caste Discrimination Alliance said it was "shocked" by the length of the timetable for protecting people known as "untouchables". But the government said the issue was "sensitive" and "comprehensive consultation" was needed. The caste system, developed in India, divides people into separate groups based on birth, marriage and occupation. The House of Lords has voted twice for legal protection to be given to the estimated 400,000 Dalits - widely known as "untouchables" - who are regarded as being beneath the caste system, living in the UK. Campaigners say people suffer abuse and prejudice because they are considered to be part of this group, affecting work, education and social life. This is outlawed in India. The government opposed peers' call for caste discrimination to be added to the Equality Act, but after the second Lords defeat Business Secretary Vince Cable announced it would be made illegal, being treated in future as an "aspect of race" under equality law. A document published by the Government Equalities Office on Monday promises a "full public consultation" starting in March next year and running for 12 weeks. This will follow an inquiry by the the Equality and Human Rights Commission. Next summer, the coalition says it will carry out "sector-specific engagement" with groups including employers, public authorities and the judiciary, who "almost certainly lack" familiarity with the caste system. The government then expects to issue a "draft Affirmative Order outlawing caste discrimination" in autumn next year, to undergo further public consultation ending in February 2015. The final draft order will be introduced to Parliament "during summer 2015", after the next general election. 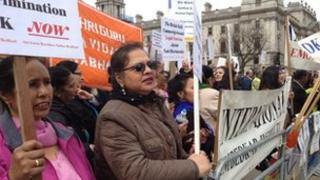 Raj Chand, chairman of the Anti-Caste Discriminatory Alliance, told the BBC: "The timescales are ridiculous. It's clear this government doesn't want to do anything in relation to bringing it into force and implementing it in the near future. "They are not treating this particular group like any other." He added: "We know there's a very strong anti-legislation lobby that's been in touch with the government. Without doubt, the government has been listening. "It's a really appalling show by the government. They say they are pushing for equality, but it seems some groups are far more equal than others." However, a government spokesman said: "It is entirely wrong to suggest ministers have acted inappropriately in regard to the issue of caste discrimination. "We want to ensure the issue of caste in the UK is fully understood, and therefore it is right that the government and its ministers discuss the issue of caste with a wide range of groups and encourage everyone to participate in the consultation. "There was strong agreement in both the House of Lords and the House of Commons that this is a sensitive and complex issue, and a comprehensive consultation is needed before any legislation can be implemented. " Does the caste system still linger in the UK?